In our palatial first-world lives the most dangerous enemy is stress. Not just irritating and draining, stress can aggravate existing conditions and pose serious health risks. With that in mind, going on holiday is our modern-day equivalent of hunting the mammoth: a life-or-death battle against our own bodies. Not all of us can take a month off and travel overseas - or even a weekend to head up the coast. How can you fit a whole month's holiday into a single day? You don't want to worry about having enough time to the extent that you get home more stressed-out than you left. Planning is the key, but you also have to find the right location. Here are three places near Sydney that might serve. The Hunter Valley region is a foodie's paradise. Over a hundred and twenty wineries spiral out across the valley, in between organic produce sellers and olive oil groves. 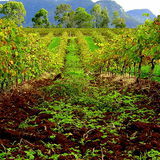 Sip a glass of wine and gaze out at the serried rows of grapevines that produced it. In this age of microwave meals and vending machines, it's worth making the most of such a direct connection to the soil. If that's not enough, you can pick your own berries - believe me, if you've never tasted freshly-picked berries, you need to - or just have a relaxing picnic amidst the beautiful scenery. The central town of Pokolbin is only two hours drive north of Sydney, so there's plenty of time to spend the whole day having your palate (and ego) massaged by the winery experts. Just up the Pacific Highway is Bobbin Head, a less pretentious area of parkland. Don't like spending your hard-earned money on the winery markups? Want to get in touch with some actual nature? Come up here for a walk or a picnic, then. Entry will cost you eleven dollars per car, which is about a fifth the price of a bottle of wine from the Hunter Valley. Enjoy the spreading grass or the deep mangroves, best seen from the boardwalk over Cockle Creek. Hike along the track at the end of the boardwalk (up to an Aboriginal axe grinding site) and work up an appetite for a park barbeque. The wide-open spaces are perfect for children's parties or a game of cricket, or both at the same time. The ominously-named Dangar Island is a little north of Sydney on the Hawkesbury River. Like many holiday towns, it swells with visitors during weekends and public holidays, drawn by its peaceful atmosphere like mosquitoes to a picnic. The lack of private cars strikes a powerful contrast to the bustle of Sydney city. As well as being quiet, it's small - you can walk around the island on the popular track and not cover more than four kilometers. Like Sydney, the beaches are of excellent quality, with historical value as well as recreational. Aboriginal middens dot the shoreline, and precocious children may wish to pick through the seaweed to find old shells or the hope of an ancient artifact. Would you like to get away for an afternoon? Tell us where you'd like to go in the comments, and pick up some suggestions of your own. Whether your taste inclines towards roughing it in the national parks near Sydney or reclining in a luxuriously-appointed health spa, it doesn't matter. Remember, we're all fighting the good fight together.